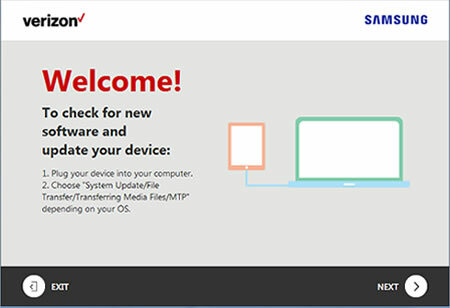 This helps you update the software on your Samsung device using your computer/PC or Mac, in the event an Over-the-Air (OTA) software update fails.This is for devices released after November 2014 only. Ensure the wireless device is powered on then connect it to a compatible computer using the supplied USB cable. The software update process may take up to 30-90 minutes. Do not disconnect the device from the computer during the repair process. The Windows® and Mac® process is virtualy the same; however, there may be some slight variations. For assistance enabling/disabling automatic updates refer to Enable/disable Auto Updates. A pop up is presented on the taskbar informing that new software is available. The software update downloads automatically. When the download is complete, click Upgrade now. Ensure the Software Upgrade Assistant (SUA) software is installed. Refer to Initial Setup - Software Upgrade Assistant for assistance. 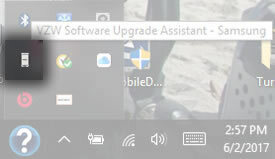 From the Windows or Mac desktop, tap or click the Utility Launcher icon / Launch Assistant (located in the lower-right taskbar near the time display). For Windows, the Utility Launcher icon is located on the desktop, not the screen with tiles. If tiles are present, click on the Windows start button (located in the bottom-left) to show the Windows desktop. Click the Software Upgrade Assistant launcher icon. When the "Welcome!" screen appears, if you haven't already, plug your device into the laptop/computer and tap or click NEXT. From the "Ready to start?" 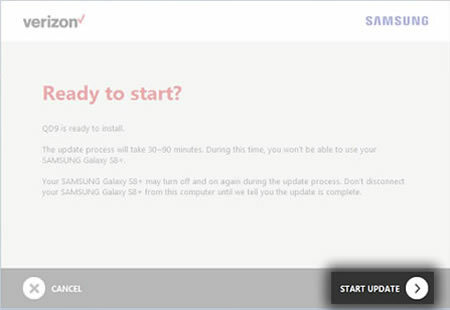 screen, tap or click START UPDATE (lower-right). Updating your phone can take up to 30 - 90 minutes. When the software upgrade process has completed, click Finish (lower-right).